Open Local Security Policy from the Control Panel and select Administrative Tools. Navigate to Local Policies \ Security Options. Double-click Network Access: Sharing and Security Model for local accounts and set it to classic. Set-item wsman:localhost\client\trustedhosts -value 10.10.10.1 (adds the remote computer with the IP address 10.10.10.1 to the trusted hosts list). While remoting can be enabled manually using Enable-PSRemoting, it is recommended to use GPO management tools whenever it is possible. Use GPO to apply policies on a single host (for example, the target PowerShell host) or a group of servers. Open the Group Policy Management console. For example, gpedit.msc. Go to Local Computer Policy > Computer Configuration > Administrative Templates > Windows Components. From the Windows Components listed in the right pane, we are interested in two of them. The first one is Windows Remote Management (WinRM) and the second one is Windows Remote Shell. 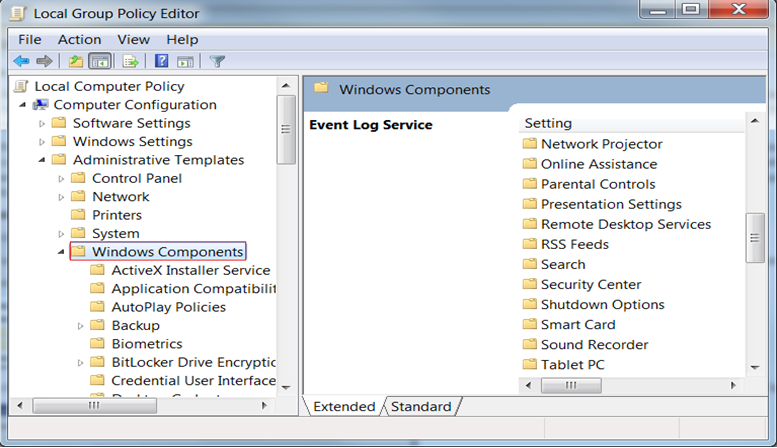 The next step will refer to the first one, therefore browse the components and open Windows Remote Management (WinRM). WinRM is the service that PowerShell uses for remote sessions. WinRM can be configured as client or service, depending on the role the host is going to have in a PowerShell connection (for example, request access to execute scripts on other hosts or allow other hosts to execute scripts on the current host). At this point, you can enable different authentication types, specify the trusted hosts, enable HTTP or HTTPS listeners, and so on. You can specify the maximum number of remote shells per user (default is 2) or the maximum amount of memory in MB for shell (the default is 150). After configuring the GPO, you might need to restart the computer in order to apply the policies or try to run the command gpupdate. Sometimes the GPO policies must be applied on multiple server hosts and repeating the above steps on every server might not be the best solution. Therefore, you can create a new GPO policy, configure it and apply it on a list of servers. Go to the domain controller or on a server where gpmc.msc is available and open it. Right-click the Group Policy Object item as in the following image and choose New. Enter the name for the new GPO and select the policy to inherit from, and then go to the next step. Right-click the new GPO and select Edit. Configure the GPO same way as for single hosts. Now that there is a new GPO, you can apply it to a group of servers. The following example shows you how to link it on an existing OU from AD; however, this can be applied to other groups as well. The GPO interface displays the existing OUs from the domain controller AD. To link a GPO to an OU, go to that OU, right click it and select Link an Existing GPO. The GPO settings will be applied to all servers contained in the selected OU. Although a GPO update might be required and also a reboot for the servers before the policies are actually applied. NOTE: remember that local policies overwrite domain policies. To establish a PSSession or run a command on a remote computer, you must have permission to use the session configurations on the remote computer. By default, only members of the Administrators group on a computer have permission to use the default session configurations. Therefore, only members of the Administrators group can connect to the computer remotely. 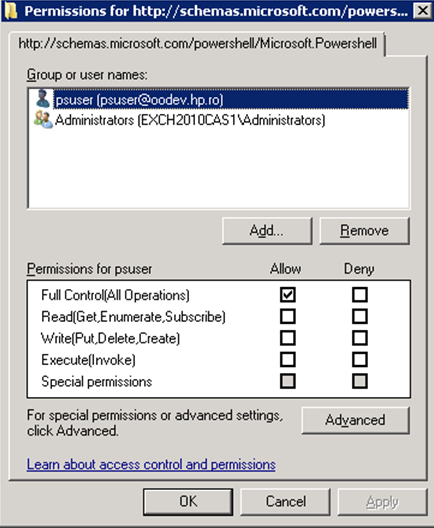 To allow other users to connect to the local computer, give the user Execute permissions to the default session configurations on the local computer. The following command opens a property sheet that lets you change the security descriptor of the default Microsoft.PowerShell session configuration on the local computer. The client and server can be in different domains. When using Basic authentication, a local user account must be provided for authentication on the remote host. Basic can be used when the destination is an IP address. Basic can be used when the destination is one of the following: localhost, 127.0.0.1, [::1]. The cluster name, as well as the hostnames of the cluster nodes can be used for the destination host. Enable-WSManCredSSP -Role Client -DelegateComputer WSMAN/*. Allow delegating fresh credentials by performing the following steps. Enable Allow Delegating Fresh Credentials and add the wsman hosts to the server list. Run gpupdate /force from command line to force policy update. Open ADUC, go to Computers > DC object > Security, select Network Service and give it Validated write to SPN. Kerberos is the method of authentication used if the client is in the same domain as the destination host, and the value specified for that host is not one of the following: localhost, 127.0.0.1, [::1]. Negotiate is the method of authentication used if the client is not in the same domain as the destination host, or the value specified for that host is one of the following: localhost, 127.0.0.1, [::1]. Digest authentication is not supported for remote connections. It cannot be configured for the WinRM server component. The client and server must be in the same domain. Either a local or a domain user account can be provided for authentication on the server host. Kerberos cannot be used when the destination is an IP address. Kerberos cannot be used when the destination is one of the following: localhost, 127.0.0.1, [::1]. The cluster name cannot be used to specify the host. Only the hostnames of the cluster nodes can be used for the destination host. Either a local or a domain user account can be provided for authentication on the server host. Local accounts can only be provided when connecting to the localhost. Negotiate can be used when the destination is an IP address. Negotiate can be used when the destination is one of the following: localhost, 127.0.0.1, [::1]. The cluster name, as well as the host names of the cluster nodes can be used for the destination host. When using NegotiateWithImplicitCredentials, no credentials should be provided. The current logged-on user account will be used for authentication. This can either be a local or a domain user account. NegotiateWithImplicitCredential can only be used when the destination is one of the following: localhost, 127.0.0.1, [::1].